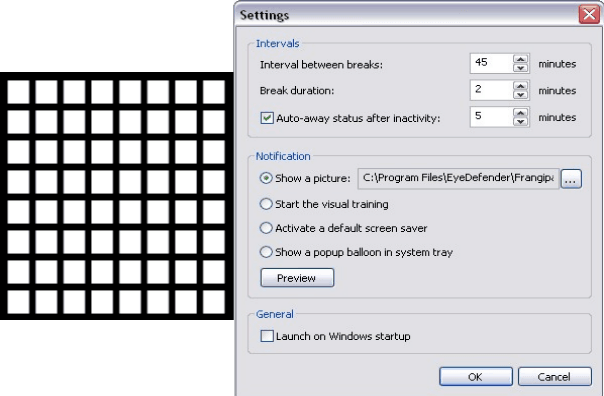 EyeDefender is a neat little free application from Eterlab Software for non commercial use that reminds you to take breaks from staring at the monitor from time to time. It helps you avoid eyestrain and prevents Computer Vision Syndrome which symptoms are headaches, blurred vision, neck pain, dry, irritated eyes, fatigue and difficulty refocusing the eyes. You can set the interval between the pauses, it also includes eye exercises which by the way remind you to blink more often :) It is available for Windows only. However if RSI (Repetitive Strain Injury) is your problem you may wanna take a look at WorkRave. Its also a freeware for Windows and Linux platforms that pops up and in a simmilar manner like EyeDefender after long hours on your PC and offers timed breaks. It will also suggest anti-RSI exercises to aviod neck pain, pain in the shoulders, and prevent headaches, backaches and carpal tunnel. It is available for Windows and Linux platforms. 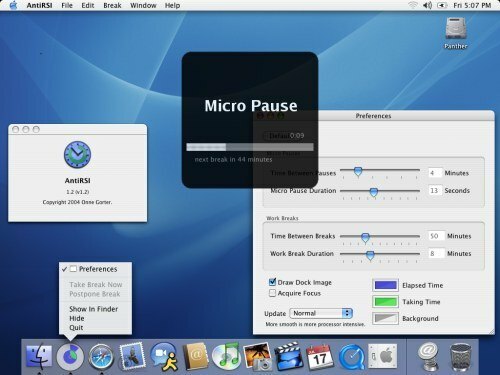 And the Mac users might wanna check out AntiRSI which is a very similar to the previous apps only by default you get 13 sec of mini pause on every 4 mins. If you don’t get your hands off the keyboard the timer restarts and it can’t countdown. Hi, at the moment I am seeking with my iphone four new pattern tips and so I have uncovered your website. Your design is actually uncomplicated but also compare it for your posts. I imagine I would use it for my primary draft. Thank you for this concept! Hello ! Love your blog.